Crawford School of Public Policy alumnus, the Honourable Gordon D. Lilo (MDevAdmin 2000) Prime Minister of the Solomon Islands returned to campus in August to discuss the future of economy of his country, with the ANU community. The feelings of excitement and pride were palpable at the Coombs Theatre, when the Honourable Gordon D Lilo arrived with Madam Lilo. Professor Tom Kompas, Director of the Crawford School of Public Policy and Government, was overwhelmed with pride to call Prime Minister Lilo one of his alumni. 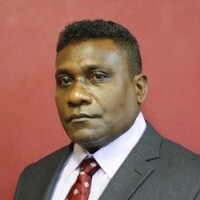 After graduating in 2000 with a Masters in Development and Administration, Mr Lilo was elected to the National Parliament of the Solomon Islands in 2001. For Mr Lilo, ANU proved to be a place that he would stay connected to and that would continue to advance his career even after he had graduated. Mr Lilo had one of his papers published through the ANU Asia-Pacific press entitled ‘Hard Times Ahead: Issues and reform in Solomon Islands Public Finance’. This went on to be presented at the Pacific Update of Solomon Islands, Fiji and Vanuatu and led to efforts to strengthen the Solomon Island’s economy. When asked how his learnings and experience at ANU contributed to his career, Mr Lilo spoke highly of the “well-rounded” education he received. This is clear through the number of key roles he has held in the Solomon Islands government including Minster of Finance, Minister for Justice and Legal Affairs, Minister for Environment and Conservation. Mr Lilo was humbled by the invitation to return to ANU and opened his speech by expressing that it was “indeed a privilege to come back to my alma mater, I still have many fond memories of my time here… It’s only appropriate therefore, that I take this opportunity to say how proud I am of this institution.” Prime Minister Lilo talked about how the Regional Assistance Mission to Solomon Islands (RAMSI) will be scaled down in 2013. He acknowledged that RAMSI has helped to improve macroeconomic and fiscal responsibility, and talked about how the transition must be handled carefully in order to sustain peace in the Solomon Islands and the region. Prime Minister Lilo also indicated that mining offers a significant prospect for the Solomon Islands economy, but acknowledged that there are challenges ahead and that they will learn first from experiences in Papua New Guinea and other regional actors. Prime Minister Lilo shared that he enjoyed his time at ANU as “it was the right environment to study in and he enjoyed the diversity of the course materials”. He talked about how much of a privilege is it to be part of the expanding group of ANU graduates who continue to shape public policy and thinking in the region. Prime Minister Lilo is just one ambassador of the quality education and experience that our graduates have received at ANU. Visit our alumni stories page to learn more about the achievements of our alumni, tell your own story or suggest an alumnus we should profile. You can watch Prime Minister Lilo’s public lecture in full at ANU Vision.